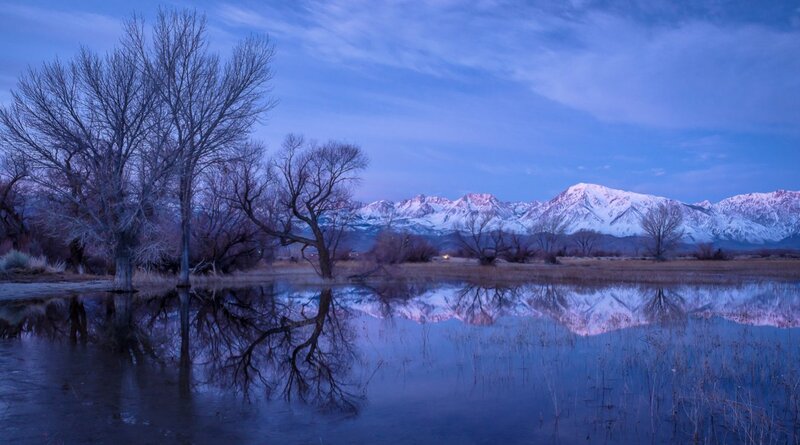 These photos were taken last week - 'Farmers Pond' in Bishop, CA. All good images Bill...but the last one sort of demands to be looked at. Deserves a Wall Award. ( printed & hung on a wall). Strong composition and beautiful light in the last one. Thanks....we'll have to see how it prints- peeping the raw file my focus is slightly off, it's not tack sharp so might not be able to get away w/printing very large - oh well, get em' next time! Nice country. Your last shot is especially cool! I like the second one the best - reflection of mountains is grand. Thank you. 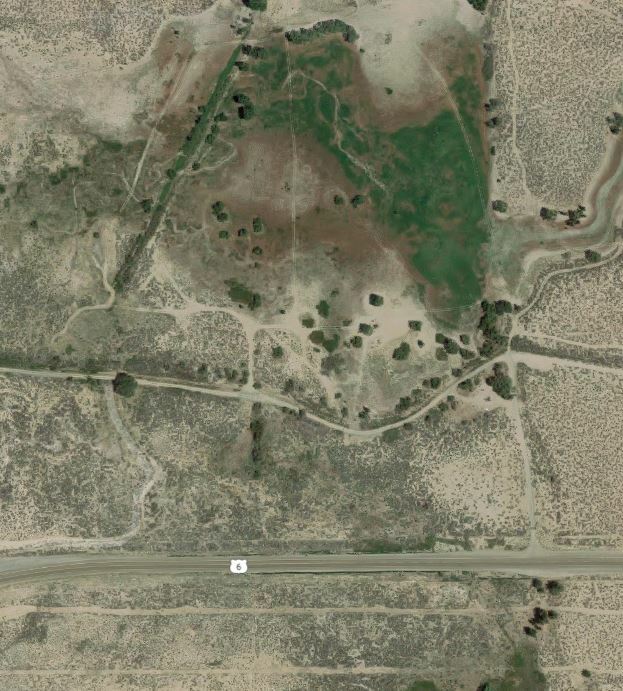 The place where that was shot is called 'Farmers Pond' by the locals. 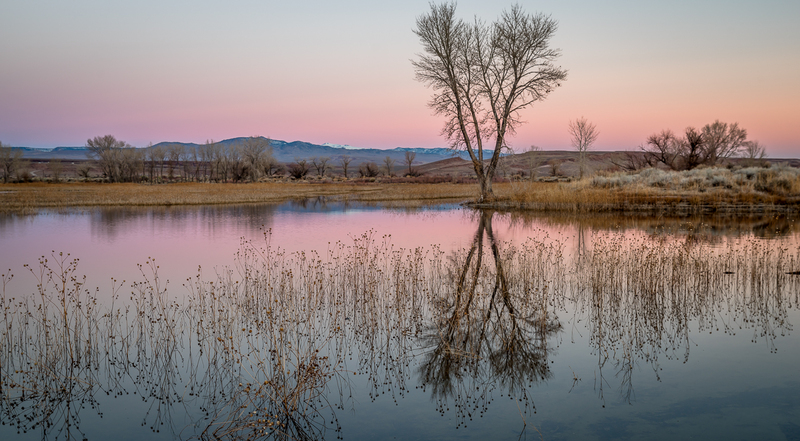 This pic was taken in same location, but a much tighter shot, it was taken in March a couple of years ago - compare the two, look at the three trees- they are in both shots;notice how much water is in that area after winter is about over. That pano is good but the mud/low water level is not so pretty....I need more water, or maybe a different camera location for the shot. Last edited by wgosma; 02-07-2019 at 08:38 AM. I really like that last shot. I think having the tighter shot really makes the mountains star, along with the clouds. As for the water line, I don't think the lower line makes the original shot terrible. But, how far would that extend in the picture? Would most of the water be gone if you had taken the tight shot on the same day as the one in the original post? Being from California, I find that Bishop area to be one of the most beautiful areas in the state. I am always mesmerized by the grand scenery and beautiful valley there. Albeit, next week I could say the same thing about a few other areas of California that mesmerize me. It's just nice to acknowledge that there is more than the famous touristy spots. Thanks. Look at the 2nd pic in the original post....right in the middle of that frame you can see the part that was zoomed in as a closeup shot in the tighter shot - look for the trees that match and the mountain peaks. You can then see that if I had taken that original/first shot w/zoom lens or just tightly cropped the photo there would be NO water in the scene at all. Farmers pond is a large but relatively shallow 'pond' when it's got water - in summer it's totally dry. 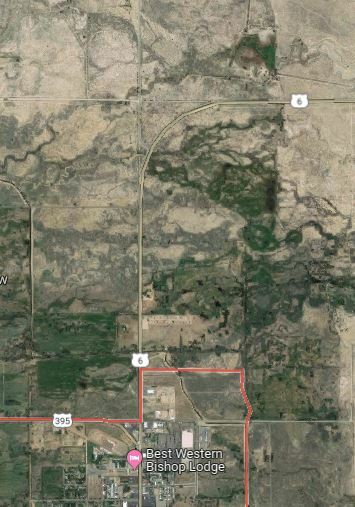 The two screen snips from Google Maps will give you idea where the place is located, right near N. side of Bishop off Hwy 6. I could recognize what you were shooting. I've shot similar scenes in the area, although not that specific pond or direction. 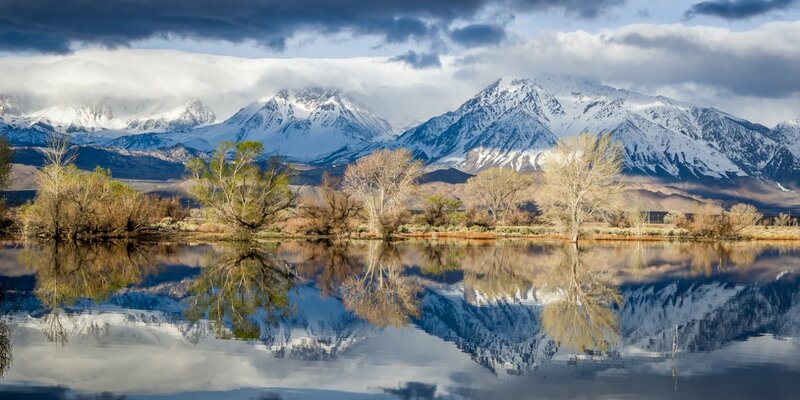 I have often gone out a little east and to the south of Bishop to take similar types of shots, although its been quite a while so I don't remember exactly where. I still like both versions. Water does make the shots neat, but that area is mostly defined by its dryness. All very nice images~ The one from the previous March is an amazing image also.